There are lots of things to consider when you buy carpet for your home. Room traffic... Carpet padding... carpet style... We have a whole list of things to consider in our buyer's guide. All of those are important considerations. But let's focus on one of the more fun aspects of carpet selection: color! After all, a carpet is one of the largest impacts on a room's decor and style. Bold colors, subtle patterns, basic neutrals - there's something for every design style in today's carpets. Color trends can help guide your choices and be fun to consider for a room makeover or new home. What color trends do we see on the horizon for Indianapolis carpets? Neutrals will never, ever go out of style when it comes to carpets. Carpets are the base of a room's design (literally) and a neutral base gives you more flexibility with furnishings and drapes. Neutral doesn't have to mean boring beige however. Today's neutral carpets include everything from rich camel brown to soft gray. Gray carpets and floors have been a growing trend for the past few years and we see it continuing. Pearly light gray, deep charcoal, and gray patterns with a metallic accent are all great ways to incorporate a gray carpet in your home. Neutrals make such great carpet colors because they are easy to accessorize. Neutral carpets let you add bright accents in area rugs, throw pillows and drapes - all room decorations that are easy to change when you are ready for an update. Think deep wine colors, amethyst, sapphire blues and deep emerald greens. These are definitely bolder choices but in the right room they will make a huge impact. One of the reasons these carpet colors are in style is because of the continued trend for metallic accents and a bit of sparkle. Jewel tones really let those accents shine. Does the idea of going bold make you nervous? Do you like the idea of a neutral carpet but really want something more interesting? 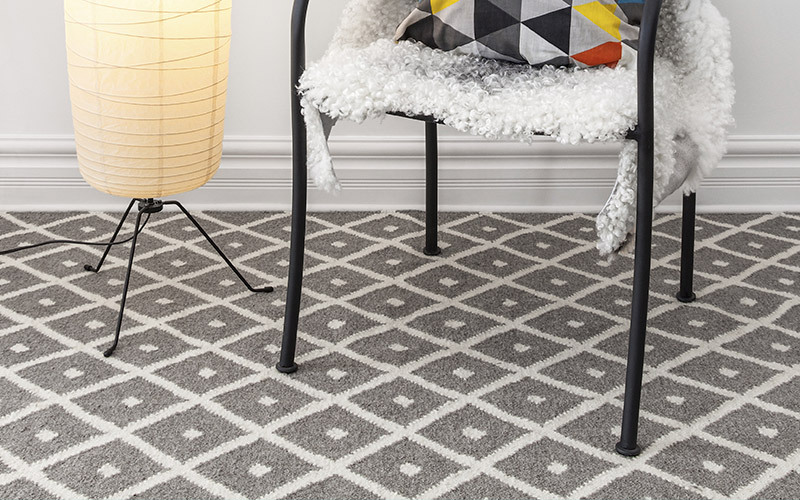 Patterned carpets are the way to go. Add a pattern to that soft gray or taupe carpet and it becomes a neutral with a bit of pizzazz. Look for a carpet with a jewel-toned pattern or perhaps a jewel carpet that is broken up with a neutral pattern. All great ways to take advantage of current carpet color trends in slightly more subtle ways. Patterned carpets are one of the most popular requests when people walk into our Indianapolis carpet store. There are styles for every decor, style and color range. Stop by our Indianapolis carpet store in the Castleton area to get a better sense of how these carpet color trends might fit in your home. Our free design staff will be waiting to greet you and help you pick the best carpet for your home, lifestyle and budget.